Frequency describes the number of waves that pass a fixed place in a given amount of time. 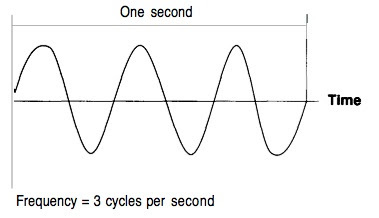 So if the time it takes for a wave to pass is is 1/2 second, the frequency is 2 per second. If it takes 1/100 of an hour, the frequency is 100 per hour. Usually frequency is measured in the hertz unit, named in honor of the 19th-century German physicist Heinrich Rudolf Hertz. The hertz measurement, abbreviated Hz, is the number of waves that pass by per second. For example, an "A" note on a violin string vibrates at about 440 Hz (440 vibrations per second).